+Kathryn Lake Hogan, +Lorine McGinnis Schulze and others with Canadian ancestry will likely jump at the chance to browse the 1921 Census of Canada images at Ancestry.com. This is an interesting prospect, since Ancestry typically waits until indexing is complete before presenting a digital image collection. Ol' Myrt here heartily applauds Ancestry.com for realizing serious researchers don't mind browsing images, if it means earlier online access. For most of us, name searches aren't as important as being able to look at the neighborhood, and images of the 1921 census of Canada fits in with that strategy perfectly. I think I was searching within 2 minutes of the census going live :-) I found my Grandpa McGinnis' sister and am still hunting for my grandparents (both sides) and great grandparents and cousins and aunts and uncles and..... woo hoo! 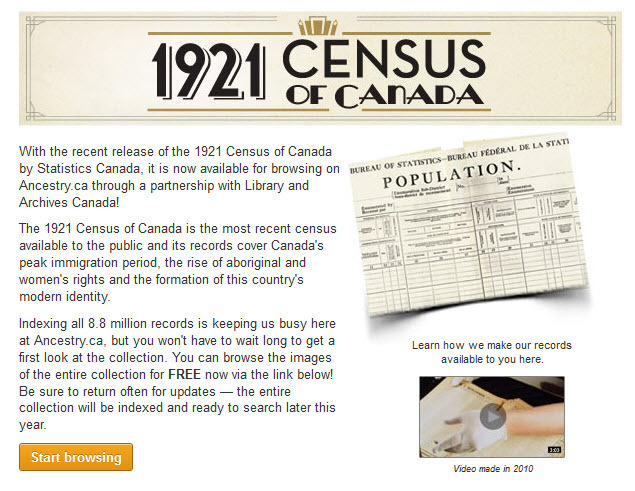 The Census of 1921 is on Ancestry.ca in browser mode because of the agreement it has with the Library and Archives Canada in 2007 which said that they would have first rights to any databases the lAC had. It will be on the LAC site three years from now, and it wil be free.